2 double and 2 twin rooms. 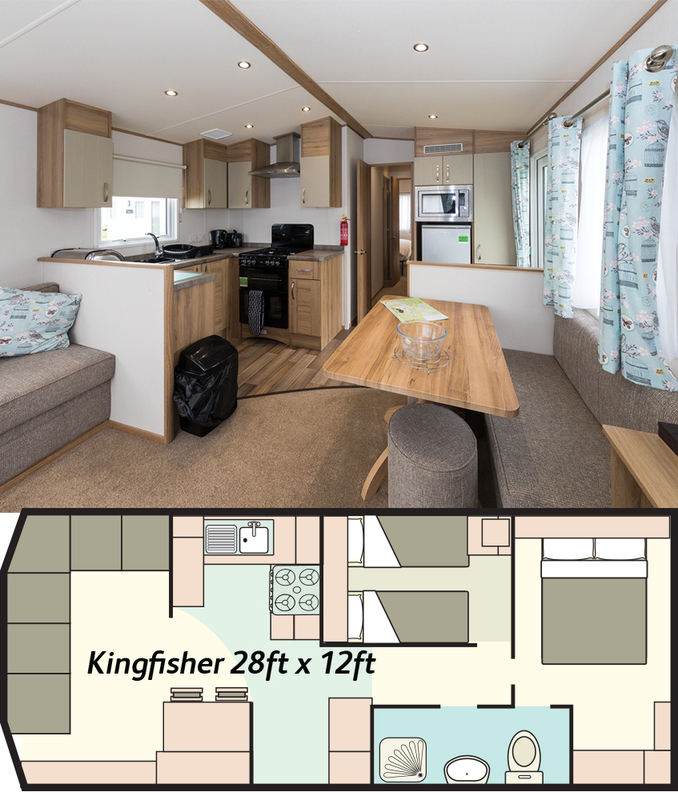 This new four bedroom caravan has one double and one twin room at each end, making it great for large groups who wish to share. 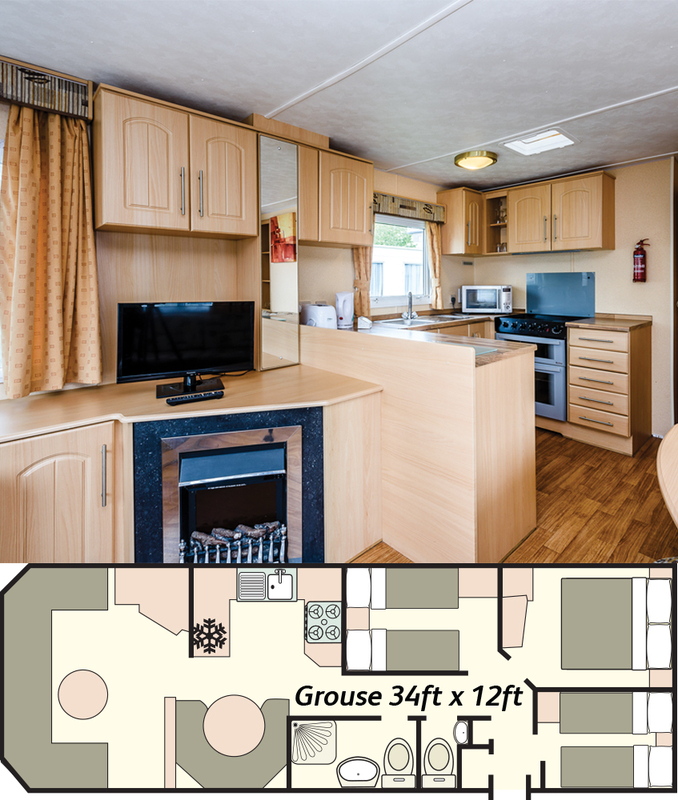 It has a popular central lounge layout and fully equipped kitchen plus double glazing and central heating. There is also a shower room with toilet, and an additional separate toilet. 1 double and 2 twin rooms. 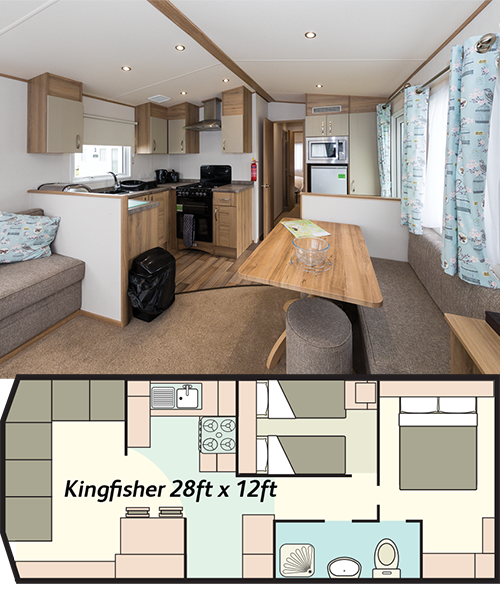 New for 2018, this modern caravan is extra wide, extra long and has a central lounge layout with bedrooms and bathrooms at both ends. It’s ideal for couples sharing. The double glazing and central heating ensure everyone stay's cosy. There is a toilet/shower room and the double bedroom also has an en-suite bathroom. 1 double and 2 twin rooms. New for 2018. 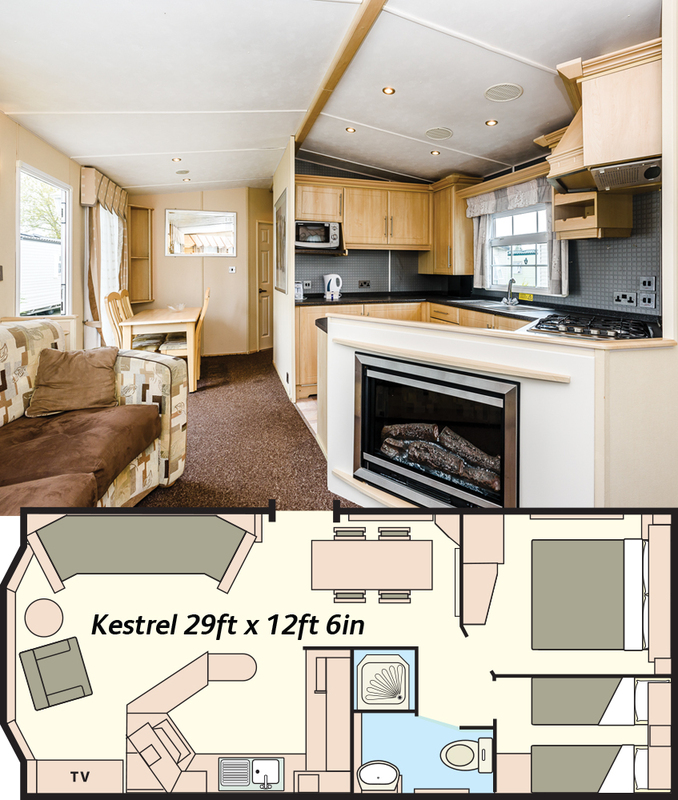 It has a spacious lounge, central heating and double glazing. There is a bathroom and additional toilet. 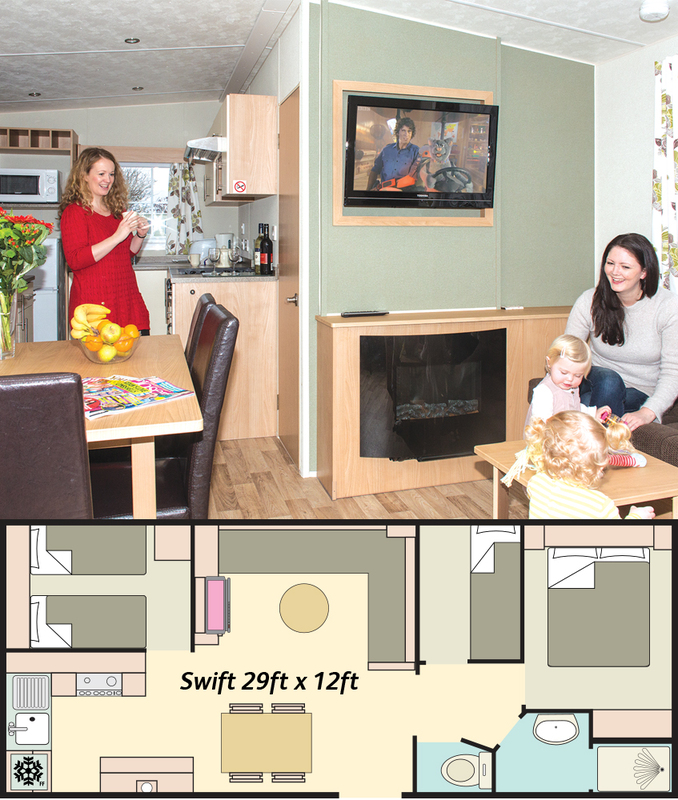 You will love the flatscreen TV with DVD player for relaxing evenings in. • Central heating • Double glazing • Extra wide • Flatscreen TV • Fridge freezer • Gas cooker with grill • Microwave • Hairdryer • Heated towel rail in bathroom • Iron and ironing board • Vacuum cleaner Please note images are representative of new accommodation and specifications may vary slightly. 1 double and 2 twin rooms. 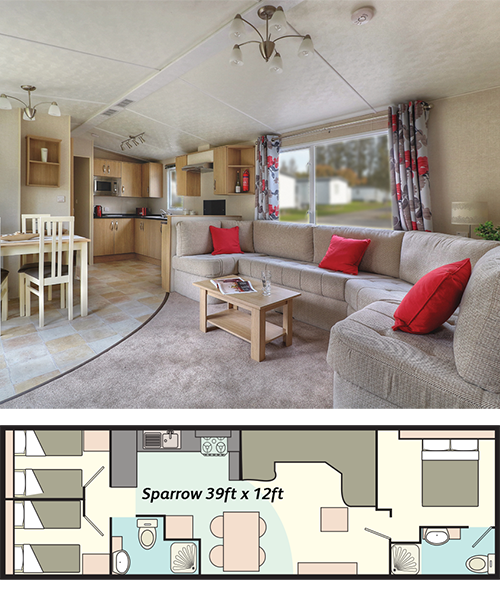 New for 2018, this fantastic extra wide caravan has a modern style and is fully equipped with everything you need for a great holiday. The double glazing and central heating ensure everyone stays cosy. • Double glazing • Central heating • Extra wide • Fridge freezer • Iron and ironing board • Vacuum cleaner • Hairdryer • Gas cooker with grill • Additional WC Please note images are representative of new accommodation and specifications may vary slightly. The Falcon 4 berth luxury holiday home is the ultimate in style and comfort. It has been furnished to a high standard and cleverly designed to give a spacious and contemporary interior. 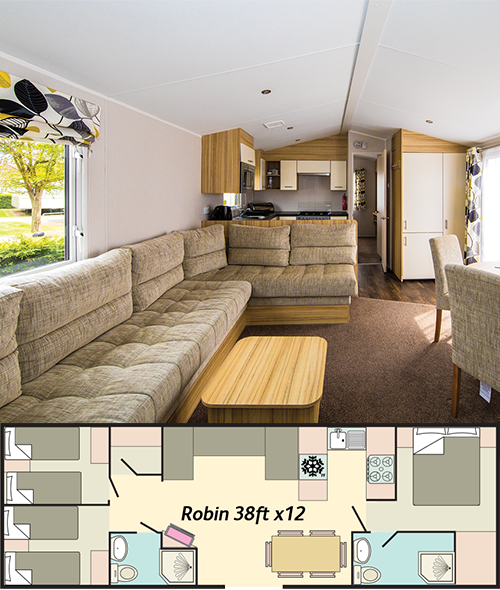 A large central lounge features a flat screen TV with Freeview and spacious dining area. 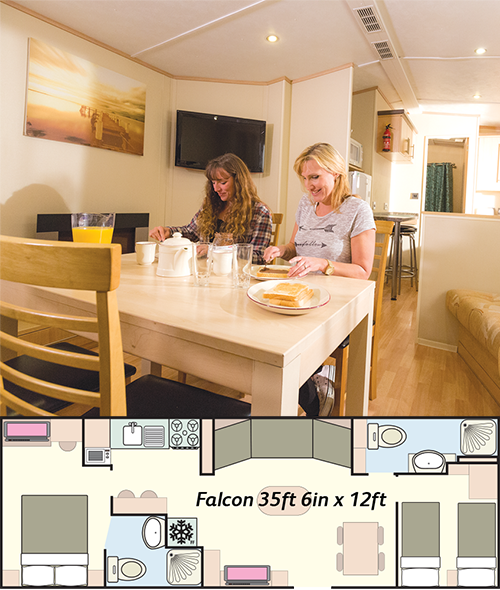 The Falcon has two bedrooms. At one end is a double en-suite with a flat screen TV and there is one twin at the other end, next to the main bathroom. New for 2017. 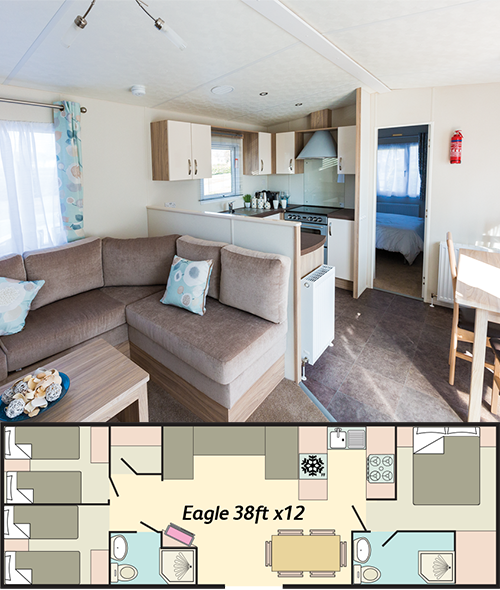 The Eagle sleeps six with a double bedroom and two twins and is ideal for couples sharing. The stylishly decorated modern holiday home has a spacious central lounge and fully equipped kitchen. Also it boasts two bathrooms - a bathroom and en-suite in the master bedroom. . 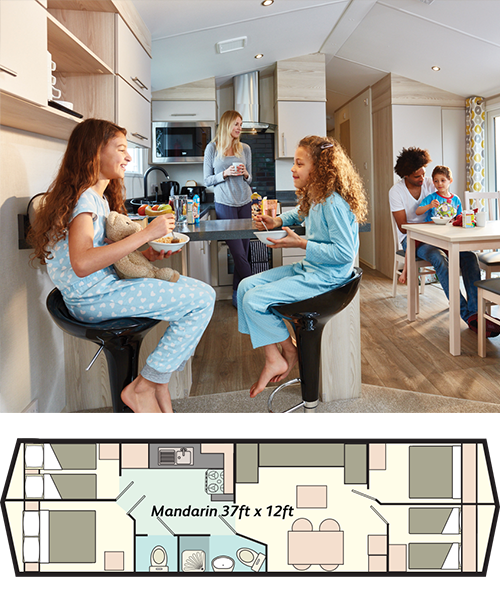 This extra wide caravan is new for 2017. 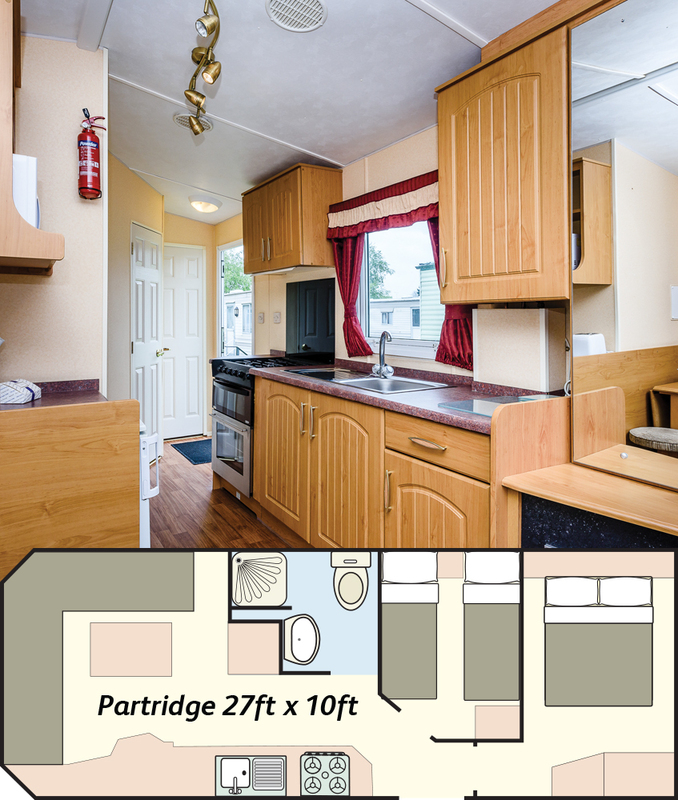 It features all the comforts from home including central heating and double glazing. 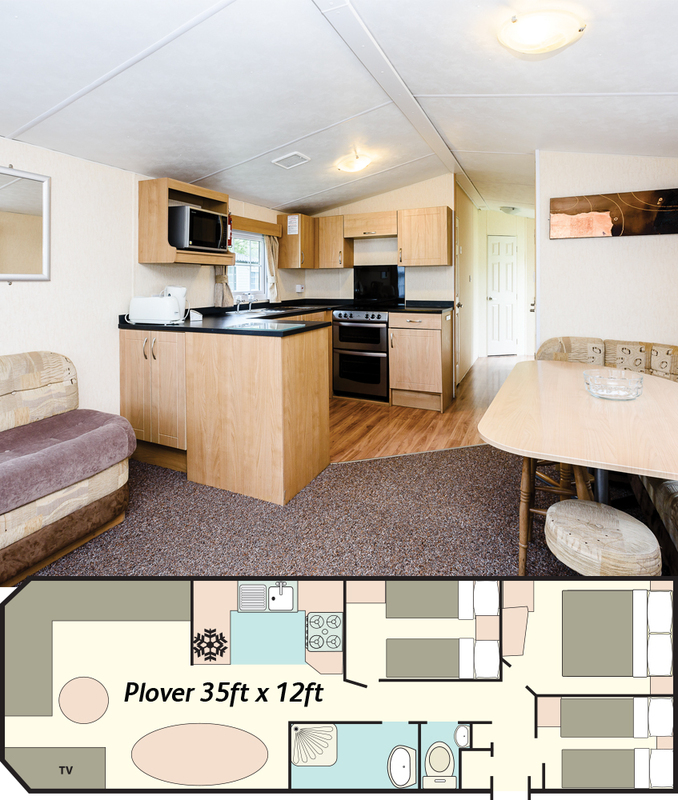 You will also find a flatscreen TV with Freeview and soundbar, a heated towel rail in the bathroom and a kitchen with everything you need for a great Weekender. 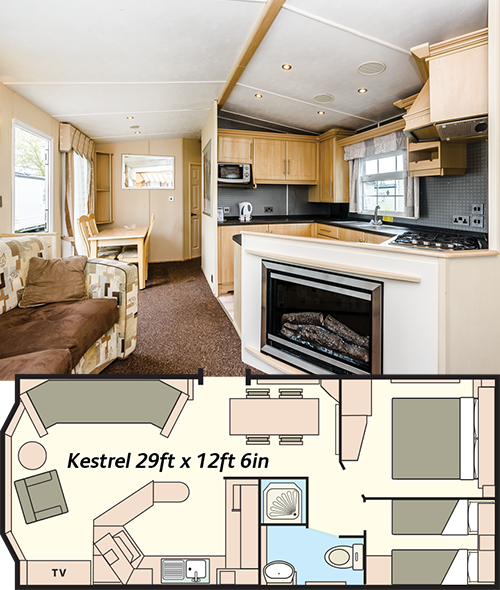 The Kestrel 4 berth holiday home has been thoughtfully designed to offer all the comfort of your ideal holiday home. The lounge area with its stylish soft furnishings and flame effect fire and continues through the fully equipped contemporary kitchen with a separate dining area. The two bedrooms (one double and one twin) are well furnished. New for 2017, this caravan is tastefully decorated and has double glazing and central heating so everyone stays cosy. Packed with home comforts including a well equipped kitchen, flatscreen TV with Freeview, soundbar and a heated towel rail. 2 twin rooms and sleeping in the lounge. Brand new for 2018, this extra wide wheelchair friendly caravan has an access ramp, sliding internal doors and a wider corridor. Plus the spacious bathroom has hand rails next to the toilet and a seat in shower. There's double glazing, central heating and a flatscreen TV with Freeview. In addition to the new disabled friendly Lapwing we also have a Lark holiday home and Breydon & Waveney Suites. 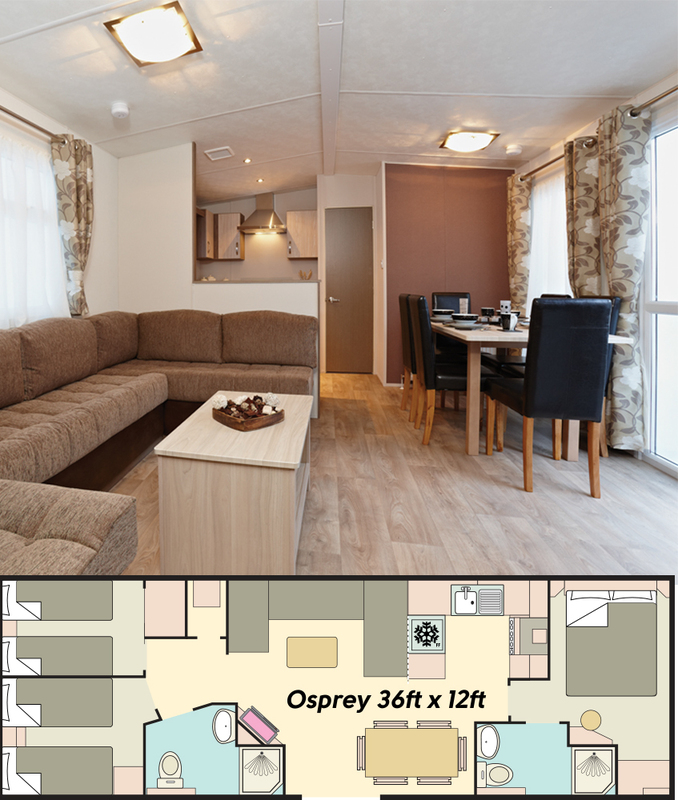 These are adapted ground-floor apartments suitable for those with limited mobility. Please call our booking team who can confirm the suitability of our accommodation for your particular requirements. 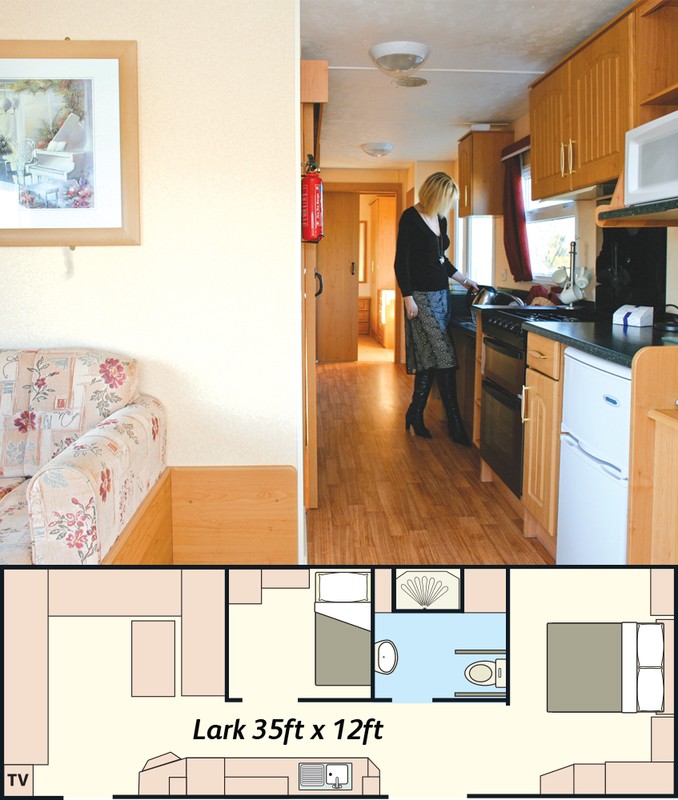 The Lark is an adapted holiday home with an access ramp, wider sliding doors a fully converted WC/shower room and LCD TV . There is good access to all areas and the dining table. It is suitable for wheelchair users with assistance. Please note that kitchen utensils and equipment may not be accessible to wheelchair users and that showers are NOT the ‘roll-in’ type. *For maximum occupancy there is a convertible bed in the lounge. 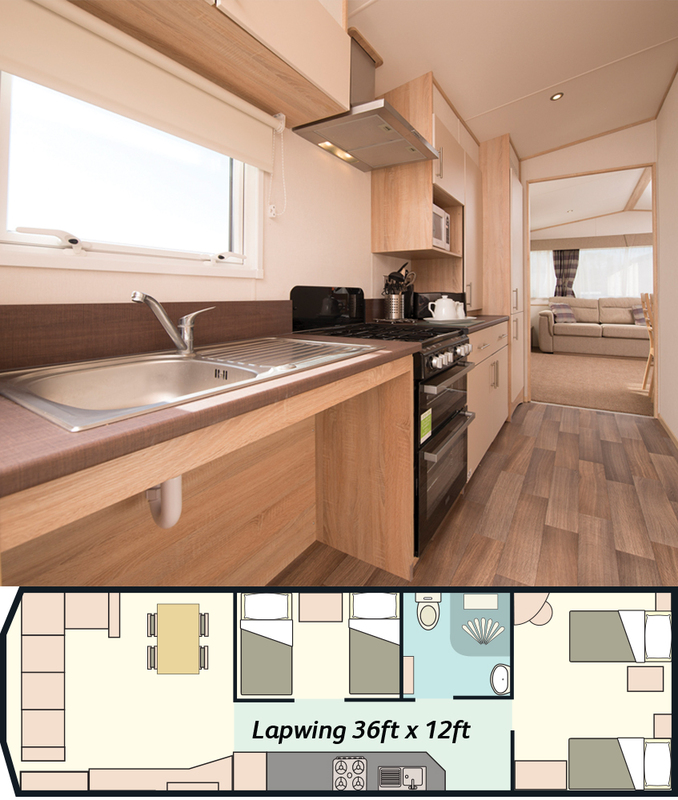 The Osprey sleeps 6 and is designed with an imaginative use of space and colour. It stands in a class of its own with a central lounge, 32in LCD TV with dining area, table and chairs. The fully equipped contemporary kitchen with a 4 burner hob and fridge. 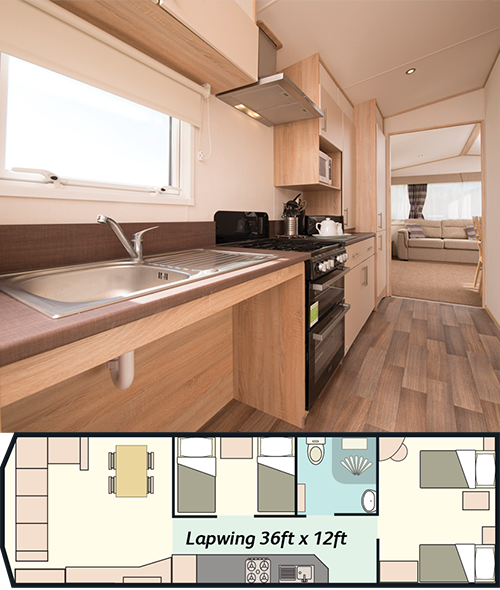 It has 3 well designed bedrooms with comfortable beds, a double with fitted wardrobe, dresser, stool and fitted mirror, and two twin. It has 2 modern bathrooms with toilet, wash basin and shower cubicle with glass door. 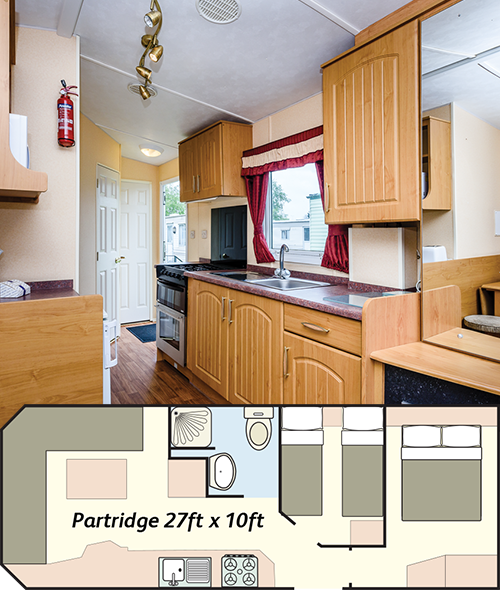 The Partridge is a 4 berth home. The lounge features soft furnishings, coffee table and storage space together with a gas fire and TV. 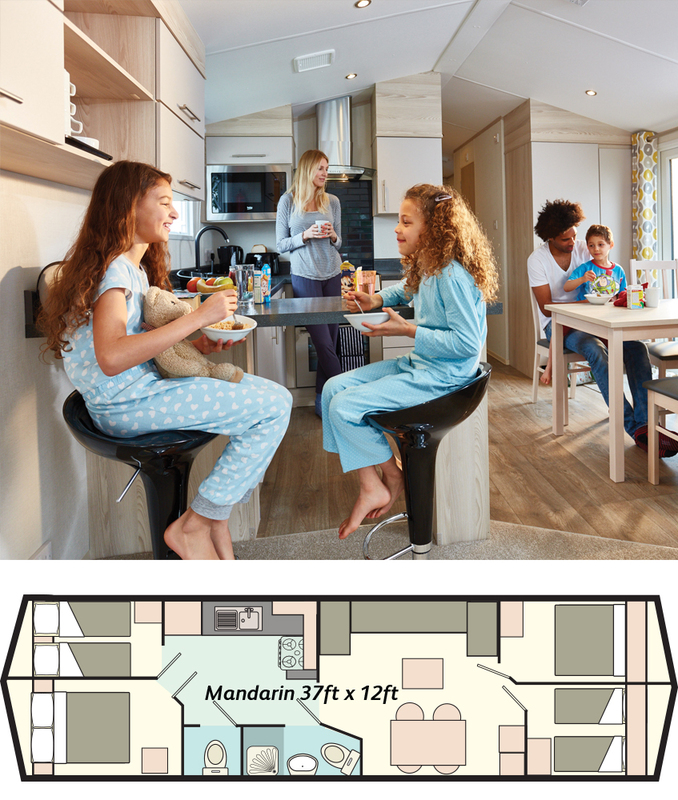 A dining table for 4 is included for meals prepared in the well appointed kitchen. 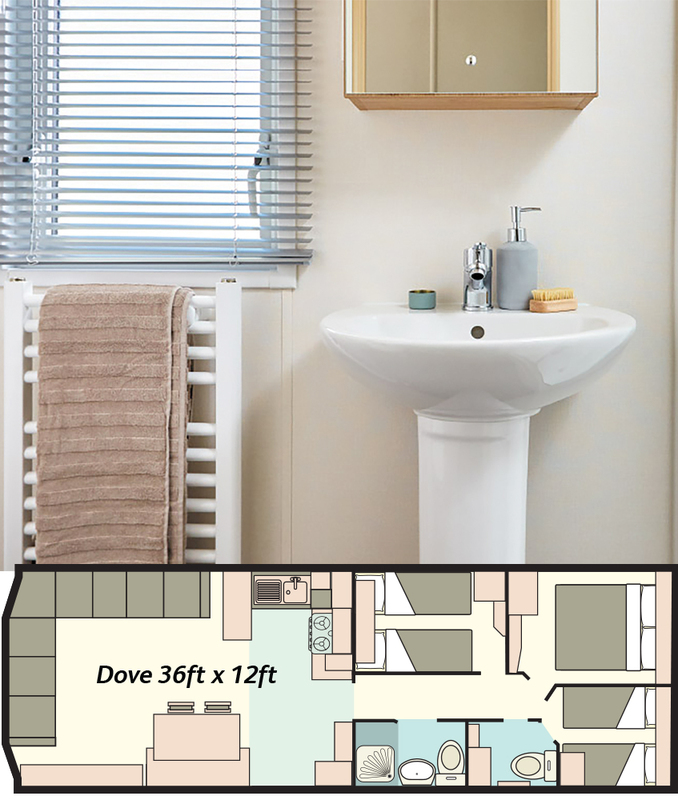 A combined WC and shower room with sink is accessed from a hallway. 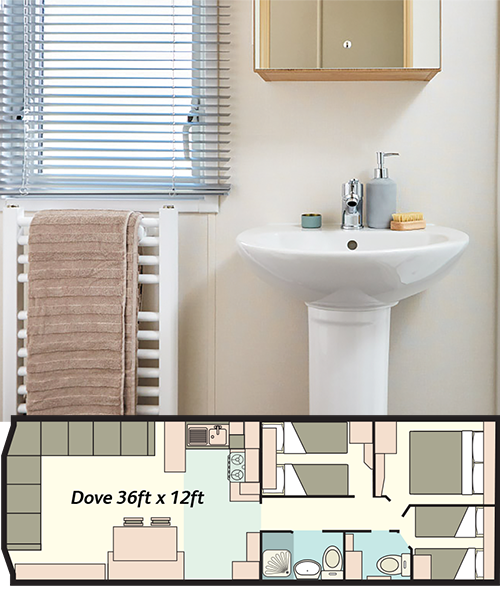 The double bedroom features a dressing table, full length wardrobes and reading lights. 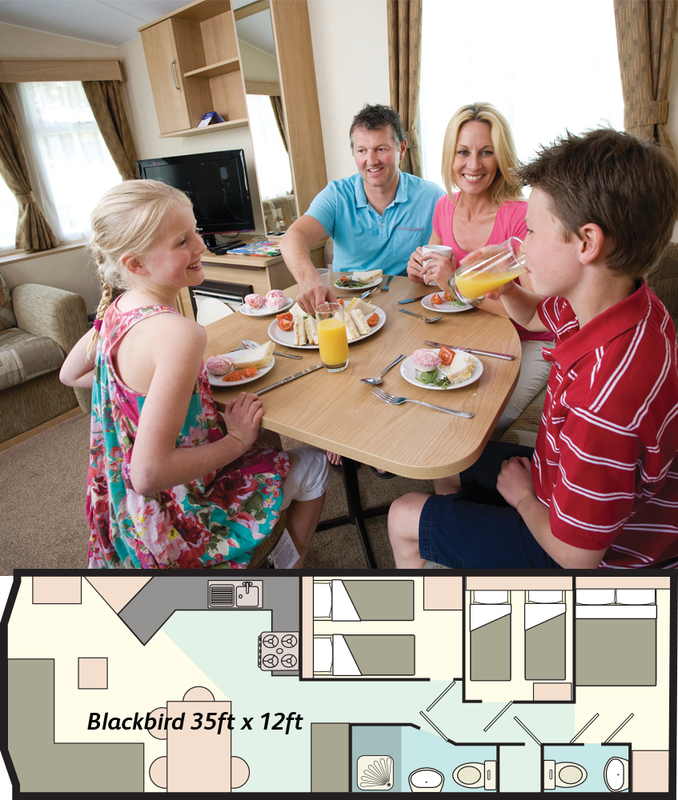 A further twin bedroom features full length wardrobes and overhead storage. The 6 berth Plover is set in a prime location and combines style and function in perfect harmony. Spacious with tasteful décor, the three bedroomed (two twins plus one double). 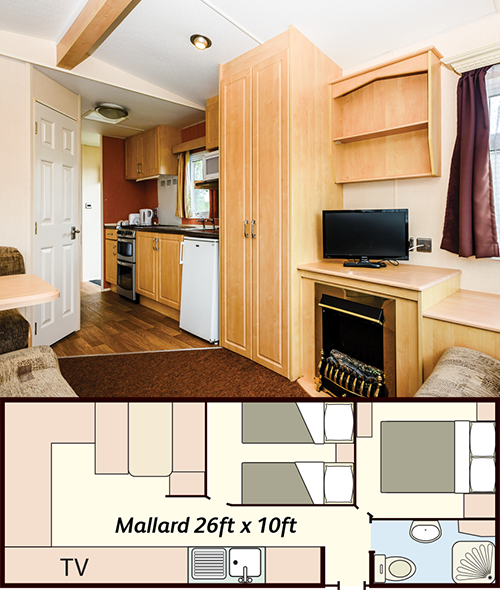 The fully equipped kitchen and dining area compliment a very comfortable lounge with soft furnishings and fire. Book early to secure this Vauxhall favourite. This stylish caravan is new for 2017. 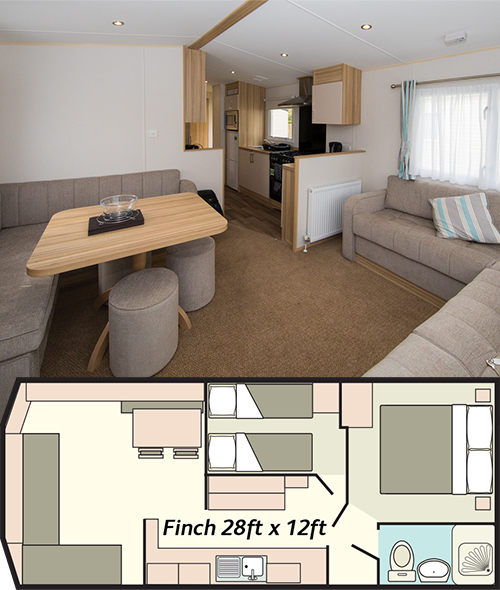 With a central lounge layout you will find bedrooms at both ends and benefit from an ensuite bathroom. It's ideal for friends or couples sharing plus there's double glazing and central heating. The Swift sleeps up to 5 and is a unique New England style. This home is ideal for couples or small family groups. Featuring a comfortable furnished central lounge, 32in LCD TV and dining area with table and chairs. It has 3 well designed bedrooms with comfortable beds, a double, a twin and a single. 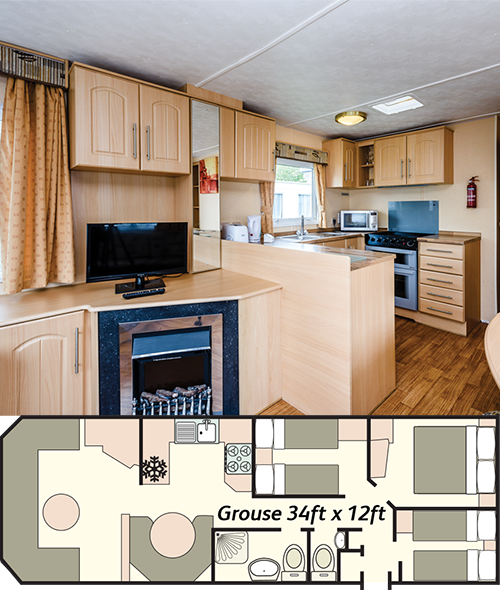 The fully equipped contemporary kitchen with a 4-burner hob and a high level fridge freezer. The modern bathroom has a wash basin and shower cubicle with glass door plus a separate toilet. A quality home with two bedrooms – one double and one twin lounge, dining area and fully equipped kitchen including microwave. The Mallard has become a firm visitor favourite.